Charts are $8 each, payable by check made out to NelsonArt or by Paypal. The price includes First Class Mail shipping. If you would like Priority Mail, kindly add $5 to your total. 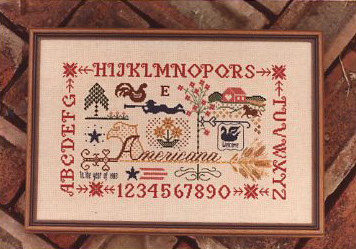 Quilt patterns, weathervanes, a sheaf of wheat and sampler lettering contribute to a new look for Americana. 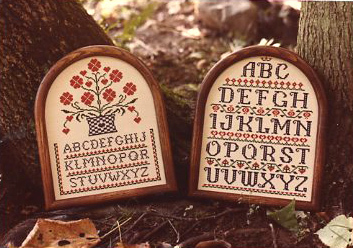 Beautiful frames from Hickory Mountain inspired these samplers, using lettering, borders and a basket of heart flowers. 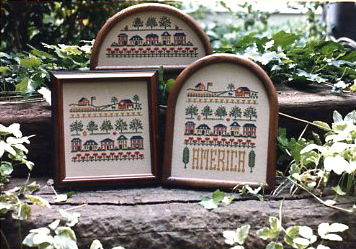 These designs must be worked on #14 or #28 in order to fit the frames. 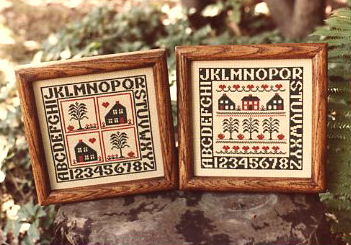 Old red and green hues create a feeling of early folk art on this pair of small samplers. 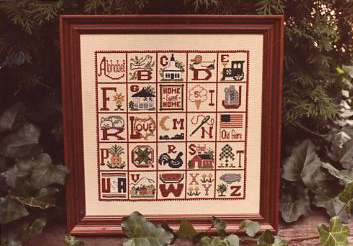 The borders are a positive-negative alphabet incorporating saltbox houses, hearts and apples. From Main Street to farm land, this chart captures the heartland of America. It may be worked entirely or in parts, as shown.